This section looks at the way pedagogical approaches suit different tool types, the need to think about forms of feedback, general considerations on the appropriateness of a tool and how to engage students with the use of new tools. Drawing upon the Learner Engagement cards introduced in 4.1, example tools you can use to support each of the eight engagement principles are listed below. The focus below is on student’s active learning through the use of technology. For ‘receiving’ approaches where the student is engaging with content you have created, see Section 3 of the Handbook. Clicking on a tool will open further information in a new window for that tool, including guides, case studies and walk-throughs. Receive Student-led presentations: PowerPoint, Prezi (external); Google Hangouts, Collaborate (synchronous delivery); SlideShare (external publishing); Replay (lecture capture). Create / Publish Text-based: Yorkshare Wiki, Google Sites, Blogger, Microsoft Office; WordPress (external). Image: Pixlr (creation, external tool); Yorkshare Wiki, Yorkshare Blog, Google Sites or Google Drive (publishing); Flickr (external). Video: Replay (assignment folders); YouTube. Debate Text (asynchronous): Yorkshare Discussion Board, Yorkshare Blog, Google Group. Chat (synchronous): Google Hangouts, Collaborate; Skype (external). Polling (in-class): TurningPoint; Kahoot (external). Explore / Collate research Exploring: Replay (lecture capture); Box of Broadcasts (BoB); YouTube; Google Scholar; University Library. Collating: Yorkshare Wiki; Google Sites; Yorkshare Blog; Padlet (external); Prezi (external); Twitter (external); WordPress (external). Experiment Data collection: Google Docs, Google Sheets, Google Forms. Virtual experiments: Lab Simulations, Open Educational Resources (embedded within Yorkshare or external). Imitate / Worked problems / PBL Video: Replay, YouTube (demonstrations); YouTube (student-created). 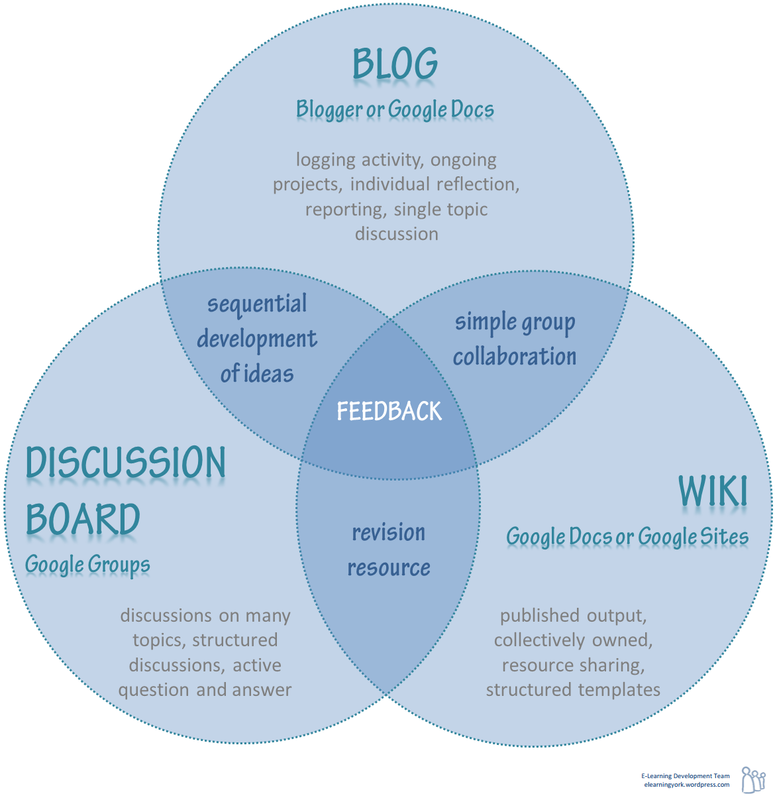 Group work: Yorkshare Blog, Google Communities; Google Sites (publishing, templates). Practice Submission and feedback: Yorkshare Assignment Tools. Applying knowledge and judging understanding: Yorkshare Quizzes. Meta-Learn / Reflection Self-reflection: Yorkshare Journal (private), Yorkshare Blog (group visible), Blogger (public). Your choice of tool may also depend on how you wish to provide feedback to students on their contribution to an activity. The act of providing feedback links the online activity to the overall student work for the module. Feedback is also a mechanism for dialogue with the student, and as such ensuring an appropriate way for providing feedback within online activities will add value and meaning to students’ contributions. Feedback is often provided through commenting functionality on online tools, else you can draw upon student contributions in class. The following diagram shows how the choice of Yorkshare collaborative tools may have different pedagogical approaches, but each still offer a means for providing feedback to students. If you have the opportunity, engage your students early in discussions about which tool to use. Enabling students to be part of the decision-making process over how the activity will run will help gain buy-in to the use of a collectively selected tool, and may even introduce you to new tools you have not yet explored. If you are designing an activity that is dependent on device ownership or the use of a particular third-party platform, survey your students in advance of the module. This will provide you with the information to tailor the activity tool set to the resources students have available based upon what students are able and willing to use. In the case study below, use of the Yorkshare Discussion Board created a safe and secure space for students to ask questions about lecture content. For the success of this activity, students would need to feel comfortable in asking questions without fear of feeling silly. This is done with establishing a sense of community to the space so that it belongs to the students for this purpose. One of the lessons learnt from this case study is that even though these students were part of a face-to-face cohort, there still needed to be an online ice-breaker activity to engage the students online and provide a sense of collective ownership of the online space. This is discussed in Section 5 of the Handbook.